Atlantic Hurricane Season Quietest in 45 Years | Watts Up With That? “There were two short-lived Category 1 hurricanes this year, making it the first Atlantic season since 1968 when no storm made it beyond the first level of intensity, according to the National Hurricane Center. To see more information on Sea Ice please visit the WUWT Tropical Cyclone Page and WUWT “Extreme Weather” Page. Hurricanes will number between, very roughly, -3.762 and 117.508. More-or-less, about. Note that no responsibility whatsoever is taken for those relying on the precision – or even the order – of these close climate estimates. No children or animals were harmed in the production of these scientifically precise numbers, from random.org, with added kitten-power from Twizzle [who’s spoilt!]. We cannot guess the next solar cycle. We cannot guess the hurricane count six months in advance. We cannot guess el Niño or la Nina a year in advance. We cannot guess Arctic sea ice extent. We don’t even try to guess cloud cover. Regardless we know with 95% certainty what is going on with CAGW for the next century. And Al Gore had a meeting with insurance companies to raise everyone’s rates due to global warming causing more hurricanes. When will Gore face jail time? This trend should continue into 2025. Then, if my hypothesis is correct, a season with out tropical storms should occur. We are in Solar minimum. Hurricanes should drop off and glacier and Polar Ice Caps should pick up. There should be longer winters and winters without summers. We may have seen the start of the cooler climate with the lost of more than 20,000 head of cattle in the winter storm that hit South Dakota 4 weekends ago. This already showed up in smaller countries over the last couple of winters with lost of elderly in the United Kingdom and lambs in Scotland and New Zealand. Using Al Gore’s counting methodology – see previous post – the US has experienced 127 hurricanes so far this year with a firm prediction for another 17 over the next six weeks. You see, this is just more proof that the climate is changing and we’ve got to stop it. Extreme hurricanes are just a thing of the past? Children won’t have a clue what these things were. :-)It won’t be long before a paper comes out blaming man’s eeeeevil Satanic gases for this awful state of affairs. It is shown that the rising number of extreme wind events in the GHG simulation is connected to the augmented occurrence of deep cyclones over Northern Europe and the adjacent ocean areas. There are also strong wind speed increases over Hudson Bay and the Greenland Sea. On the Extreme Weather page, what’s with the Tornadoes’ US Departure from Normal Annual Running Total 2011 vs 2012 — yoo hoo, it’s 2013 now. What a tragedy for the catastrophists! looking at your 3rd graph you can see that up until about 98 hurricanes were up , globally, whereas from that time they were down, similarly to temperatures going up until 2000 and global temps. down from 2002. You can see what’s happening? In 7 years time there will be disaster. No winds…no rain…just droughts up north. Lets stay with the current data as compared to past data and not get mired into fanciful futures. A fact is a fact and this past season is still weather. “The sixth indicator is experimental and is included in the experimental version of the CEI. In the case of tropical systems, any landfalling system is considered extreme. Since precipitation from such a system is already accounted for in the precipitation steps and can also affect the PDSI, wind velocity at the time of landfall is the focus for this indicator. The square of the wind velocity of each tropical storm and hurricane at the time of landfall is used since a linear increase in wind velocity corresponds more closely to an exponential increase in wind impact and damage. Because this step only accounts for the strength and frequency of tropical systems at landfall (and could not theoretically affect 100% of the nation), it was necessary to scale the step 6 time series to make it comparable to the other five steps. This is done by setting the mean of the time series to that of the other five steps. A CEI both with and without the tropical cyclone indicator is made available in the plots below. A value of 0% for the CEI, the lower limit, indicates that no portion of the period of record was subject to any of the extremes of temperature or precipitation considered in the index. In contrast, a value of 100% would mean that the entire country had extreme conditions throughout the year for each of the five/six indicators, a virtually impossible scenario. The long-term variation or change of this index represents the tendency for extremes of climate to either decrease, increase, or remain the same. 1. The sum of (a) percentage of the United States with maximum temperatures much below normal and (b) percentage of the United States with maximum temperatures much above normal. 2. The sum of (a) percentage of the United States with minimum temperatures much below normal and (b) percentage of the United States with minimum temperatures much above normal. 3. The sum of (a) percentage of the United States in severe drought (equivalent ot the lowest tenth percentile) based on the PDSI and (b) percentage of the United States with severe moisture surplus (equivalent to the highest tenth percentile) based on the PDSI. 4. Twice the value of the percentage of the United States with a much greater than normal proportion of precipitation derived from extreme (equivalent to the highest tenth percentile) 1-day precipitation events. Also, the Extremes in Landfalling Tropical Systems graph shows the Most Recent 12-Month Period (Feb-Jan), thus it is not to present. I would expect that it would return to zero like 2010 and 2011, once it is updated in Feb 2014. On the two-tailed Gaussian distribution this lack of hurricane activity falls into the extreme low end of occurrences. Thus, it is representative of extreme weather and fully supports climate change and global warming. Should next years hurricane activity be completely average, it could be judged representative of extreme average weather and fully support climate change and global warming. But then, what doesn’t support global warming? “Atlantic” and “US” are different things. I almost wish we did have a major hurricane this year. We know The Weather Channel has “gone green” but to keep recycling Sandy……..it must be getting boring even for them. Obviously, the heat that used to go into hurricane formation is now being sucked into the deep oceans. Scary thought for Halloween, no? How many thought of Ross Perot? Most hurricane scales go up to five, but Algore’s goes up to six (with apologies to Spinal Tap fans). Big storm due this weekend the other side of the pond. 80 mph winds. No guesses as to headlines. Good golly, did ya have to quote Masters! He is one of the biggest alarmists out there. When the weather channel bought his Web site their alarmism stepped up 2 fold. BTW, he is an air pollution meteorologist. WUWT? Oh, for chrissake! I can’t keep this tripe up for much longer. Just give me my bloody Nobel! Well researched, as usual, JTF. But but but more frequent weather extremes are consistent with global warming…err, climate change…theory. Is the windy stuff hiding somewhere? The UK papers are full of a monster storm arriving there on Monday, where is it coming from if you guys are having it so good? the forecasts are based on statistical models…. What the purpose of top figure in the post (Extremes in Landfalling Tropical Systems)? It seems to me it is decidedly misleading both graphically and descriptively. First off, what “Extreme” are they featuring with the graph? Is it up to the reader to spot it? Secondly, it’s not particularly clear what “Tropical Systems” count. By my understanding, I would think it includes more than named storms since they have descriptions for the “Tropical Systems” — Tropical Depression, Tropical Storm and they are classified Category A and Category B with max sustained wind speeds and damage estimates. But they show nothing for 2010 or 2011, which means it doesn’t include those, so it would mean would it is limited to hurricanes But they would then need to eliminate Irene in 2011< which made landfall in NC, for some reason, wouldn't they? Then they have 2012 with a 14%, but there were ten hurricanes in 2012 of which either one or two made landfall in the US and there were two hurricanes Issac and Sandy so the percentage should be either 10% or 20%, not 14% right? Now I look at 2006 and there we only 5 hurricanes in 2006, none of which made landfall in the US, yet we have a bar showing 93%? What's going on here? My intent to write this comment started with the thinking there ought to metric incorporated to distinguish between 3 out 3 landfall yearly event vs 3 out of 4 or 3 out of 6, as well and comparing 0 out of 1 or 0 out of 6, none of which you can do with only a 20% average as a guide. I had also thought some shaded standard deviation might help in gauging what is supposed to be the "Extreme" that is shown on the graph. But now I'm just wondering what info they used to create this graph? I can’t stand this normalcy! Soon, global warming alarmists will be a thing of the past. We won’t know what an alarmist is. Sadly, the lack of destructive storms making landfall or disrupting shipping is a bad thing. During this quiet time, more people are forgetting just what these storms do. They’re building up in unsafe areas. They’re building their homes by the shore. They’re reducing budgets for disaster relief because they’re not using it. They are getting complacent. Next time a Cat 1 hits, it’s going to be non-stop bleating about unprecedented destruction and unusual climates. A whole new generation will be blind-sided by what they think is an unexpected catastrophe. And it will all be because of “carbon pollution”. is strictly (scientifically) speaking a bit of a let down, coming from such august institution, namely the 5 year moving average is displaced by 2 (2.5) years to the right. At this rate tropical storms may quickly become things of the past… Children just aren’t going to know what a good ole hurricane is. Or, again, they may. Anyway, the extreme lack of storms is extreme weather in itself, may well be worse than we thought. If nothing else, projected massive loss of reconstruction jobs is a nightmare. More to the point the 5yr average at all time lows. Or do we need a 17yr moving avg to draw any comment under the new rules? In some of the communications above I saw phrases such as “above normal” and “below normal.” Weather cannot be logically treated in terms of “normal.” Normal means conforming to a norm, a pre-set reading or figure arrived at in each case, but not applicable to a chaotic system such as weather is. For example: Normal eyesight has been designated in part as 20/20 (seeing something 20 feet away as though it actually is twenty feet away); as playwright George Bernard Shaw learned, he had normal eyesight, which condition was very rare, according to his oculist. Today in central Virginia the high temperature has been 56 degrees Fahrenheit after an early-morning low of 27 with frost. The average temps for this date are (guessing here) about 68 and 48. Thus, our high today is about 12 degrees below average, and the low about 21 degrees below average. Is this, therefore, an abnormal day? Hardly–it is perfect late October weather that happens to be cooler than average. Earlier this month the temperature reached 90 degrees one afternoon, which at that point in the month was about 18 degrees above average. Unusually warm, but nowhere near a record; not abnormal; just not average. Now if I were a layman,(I am), and I was just eyeballing Fig 1 ( I am ) I could conclude that it was the global cyclonic activity that dispersed the rising ocean heat in both the time periods ’93-’98 an’ 03-’07. Then I might think about these storms as a global temperature regulator. But alas, I am just a layman and just eyeballing a simple chart and will leave it to the experts to decipher. Okay, I never expected. Is there useful purpose for creating this graph? I’ll post another Blog during the off-season that explores the probability that the 2014 season may be even quieter than this year. Could we possibly get some statistics on the sale of baked beans in relationship to the magnitude and frequency of hurricane/cyclone activity. I’ll admit to being stupider than a stone. But, have you any better metrics to use ? If so, please enlighten us. This is an important point to make. That is also why I shiver when I hear the term “Superstorm” Sandy. Sandy was “super” because of death and destruction for the reasons you just described and it was only a Category 2! I would also watch out for the Warmists spinning this recent NOAA statistic. Anything deviating from the average frequency is considered Extreme. Too many, or too few. You can all already see it appear in The Literature. Lack of Hurricans/Tornadoes being “blamed” on Climate Change /Global Warming. So why do they make predictions that are years in advance. Meanwhile National Geographic has a scary looking tornado on its cover with with the even more scary headline THE MONSTER STORM. Should next years hurricane activity be completely average, it could be judged representative of extreme average weather and fully support climate change and global warming. But then, what doesn’t support global warming? The following supports the assertion that AGW will not affect Hurricane Activity (along with the fact that hurricane activity has been the lowest in modern history) and that IPCC works to push an agenda rather than to solve a scientific puzzle. Not surprisingly the IPCC have failed to solve the scientific puzzle. No worry other scientists are still practicing science. See paper attached to end of this comment. William: In response to your last question what does not support AGW. The following does not support global warming. The following supports (one of about 6 fundamental observations/analyses that disproves the AGW hypothesis) the assertion that the majority of the 20th century warming has caused by solar magnetic cycle changes rather than the increase in atmospheric CO2 and that the majority of the increase in atmospheric CO2 was caused the warming, rather than by anthropogenic increases. If the assertions made in the attached paper are correct the planet will now cool and atmospheric CO2 will now drop. …As cause always must precede effect, this observation demonstrates that modern changes in temperatures are generally not induced by changes in atmospheric CO2. Indeed, the sequence of events is seen to be the opposite: temperature changes are taking place before the corresponding CO2 changes occur. …. …..As the theoretical initial temperature effect of changes in atmospheric CO2 must materialize first in the troposphere, and then subsequently at the planet surface (land and ocean), our diagrams 2–8 reveal that the common notion of globally dominant temperature controls exercised by atmospheric CO2 is in need of reassessment. …. ….Empirical observations indicate that changes in temperature generally are driving changes in atmospheric CO2, and not the other way around…. Thanks again for that additional info, JTF-WUWT. I’m just a lowly civil engineer, so while I’m generally conversant in the sciences, this climate stuff is not my bailiwick and when it gets complicated, I only try to take what’s given and lay it over general principles to get a feel for what is being presented for understanding it. That is why, lacking any explanatory legend, I was so off the mark in my presumptions of what they were graphing. I’m not sure what to make of your bolded portions of their explanation. I have no clue what they mean by “This new indicator is calculated only for periods in which tropical storms and hurricanes are consistently active. Results for periods where tropical system activity is extremely infrequent (i.e. a few observations for the entire period of record) were difficult to work with and were subsequently left out of the index.” Did they skip 2011 because Hurricane Irene and TS Don and Lee weren’t worth the effort or something? I think my last question still pertains: For what useful purpose is this graph being created? Or put differently, What will this graph help climate scientists understand? Currently, 2013 as far as ACE goes, is the 7th smallest ACE since 1950, and in two days that drops to 6th smallest. Yeah team! All summer I waited for the ITCZ to move north, as it usually does, to generate those big cyclonic storms that surge across the Atlantic. It never happened and neither did the hurricanes. Maybe some of you could explain why the ITCZ stayed so far south that it was seldom north of the South American land mass. CO2 in the atmosphere makes the air heavy and butterflies are having trouble flapping their wings. Also global warming is reducing the number of butterflies. Could someone explain to me, when measuring hurricane activity, why only landfalling hurricanes are considered.? It is interesting to speculate, of what other things accumulated cyclone frequency and global hurricane frequency might be a proxy. Well, d’uh, Phil. Was Dr. Trenberth in the room when you wrote that? C’mon, just say it: MODELS DON’T WORK. Simple. Fact. You didn’t explain why ACE is a stupid metric. I think it is a useful measure. Why do you think it is stupid? It isn’t the case that only landfalling hurricanes are considered. 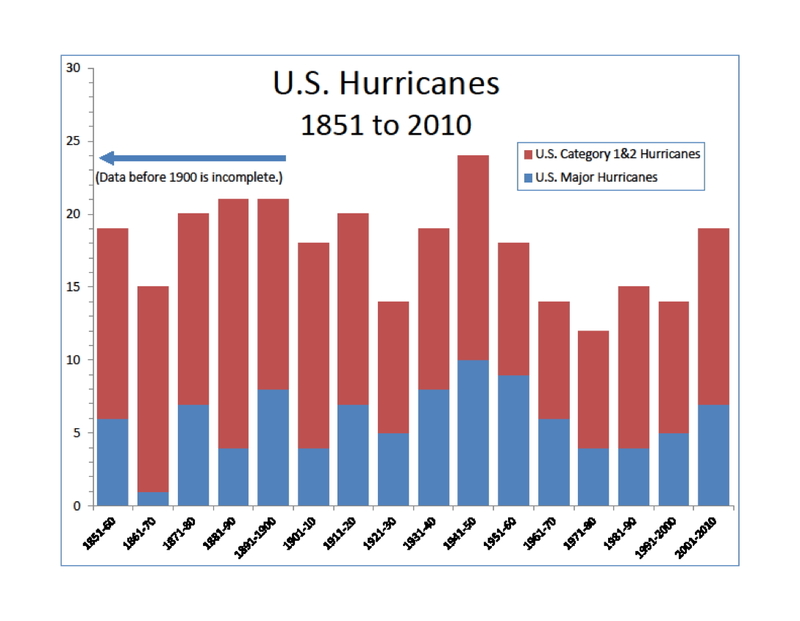 There are many metrics, and people look at both total hurricanes as well as landfalling. However, there are (at least) two reasons for being interested in landfalling hurricanes. The obvious one is that if you are interested in the damage caused, as you might be if you are an insurance company, or a relief agency, it is the landfalling hurricanes that are of interest. A second technical reason is if you are trying to do some analysis of long term numbers. Prior to satellites, non landfalling hurricanes could be missed. If they weren’t tracked by ocean going ships, no one might know they existed. In contrast, no one missed a landfalling hurricanes, so the count of landfalling hurricanes is accurate over long period of time, while the counts of all hurricanes is much less accurate in earlier years. There does appear to be a slight correlation between the PDO and hurricanes. However, given the small amount of data it might just be coincidence. Has anyone studied this? As for the value of ACE, I think it is important. Tropical cyclones are heat pumps. They pump energy from the surface and oceans to space very efficiently. The ACE index gives us a global indicator of how much energy is involved in this process. The current low ACE values show us the planet is retaining more energy. That may be one reason why we haven’t cooled as much as we might otherwise would have with a negative PDO. Phil Klotzbach notes that the atmosphere is chaotic. If you read Chaos Theory you will that there are “attractors” that are identified to explain how choatic systems behave. Currently a number of models, other than long term climate models, are showing varying degrees of bias in their outputs. Joe Bastardi, on Dr Spencer’s blog noted that for the last 7 months weather models have forecast warm and the forecast gets colder as the date approaches. The NOAA forecast on the Southern Oscillation is biased toward El Nino. The hurricane forecast was a bust and the number of tornados was much lower this year. These are the ones that I have noticed, there are probably more. I suspect that one or more attractors in the climate system have changed and the changes are not recognized by the models. Does anybody have any ideas? In my neck of the woods the expected storm to hit the UK on Monday is already being blamed by the alarmists from FOE on climate change and say the next 3 or 4 years will give us even bigger storms. I do wish these morons would just go away and leave us in peace. “We’ve been in this multi-decadal pattern of activity but it just didn’t happen this year,”Masters said, referring to the prolonged period of increased hurricane activity that began in 1995. Correct about T gradient & storms. Wrong that warmer temperatures are attributable primarily to CO2. In uncooked books, temperatures were higher during the last warm interval, in the 1920s to ’40s, the second such phase since end of the LIA. As you know, milder WX isn’t what CACA advocates mean by “extreme”. Given 1), why was 2) forecasting an active hurricane season? I recall Bob Tisdale’s article here at WUWT showing the underwhelming warmth of hurricane alley from W. Africa onwards showing a bit of heat in the Gulf of Mexico but otherwise lower SST on average. At the time, I, a mere layman was perplexed at the “active h. season” forecast. Even the ENSO was neutral, which is apparently unfavorable. La Nina’s are indicators of strong Atlantic huricane seasons. Here is a paper from NOAA itself on the subject. Naturally, any deviation more than 0.5% from the long-term average is proof positive that MMGW exists and requires governments to take control over energy and the means of production immediately or we’re all doomed doomed DOOMED! I find that as we are moving back, up, from the deep end of the 88 year sine wave, there will be a standstill in the change of the speed of cooling, neither accelerating nor decelerating, on the bottom of the wave; therefore naturally, there will also be a lull in pressure difference at that > [40 latitude], where the Dust Bowl drought took place, meaning: no wind and no weather (read: rain). However, one would apparently note this from an earlier change in direction of wind, as was the case in Joseph’s time. According to my calculations, this will start around 2020 or 2021…..i.e. 1927=2016 (projected, by myself and the planets…)> add 5 years and we are in 2021. We urgently need to develop and encourage more agriculture at lower latitudes, like in Africa and/or South America. This is where we can expect to find warmth and more rain during a global cooling period. We need to warn the farmers living at the higher latitudes (>40) who already suffered poor crops due to the cold and/ or due to the droughts that things are not going to get better there for the next few decades. It will only get worse as time goes by. We also have to provide more protection against more precipitation at certain places of lower latitudes (FLOODS! ), < latitude, especially around the equator. We’re tipping into a dangerous period of lack of extremes. Why isn’t anybody worried?! sometimes you must take the time and trouble to wake Him up? Makes quite a liar out of the alarmists who claimed there were “70 percent more severe weather events in 2012” at the Senate committee meeting, doesn’t it? Or just pray that people recognize humor when they see it? Henry, as far as I know, U.S.is an exporter of most agricultural products – projected net exports at $140 B, and imports at 105 B for 2013. Whereas some farmers may be able to parlay a misdirected climate change policy into a subsidy, I’d guess their biggest concerns are with current prices, which determine how much they plant and how much they harvest. As long as there is abundance (and usually there is in the U.S.), prices reflect that. In times of dearth, or when they can keep certain products off the market long enough, farmers can sell what they have at inflated prices. U.S. is big. A drought in one part of the country will mean a bumper crop somewhere else. One useful adaptation might be to help all our most reliable trading partners to have the strongest annual crop production they can have – in the event that the entire U.S. were to be blighted. Isn’t this more an argument for global warming that against? I mean, after all, the more extreme temperature differences are what feeds stronger storms, and smaller temperature differences result in less severe storms… Isn’t that correct? Snow was never again to fall in Britain. Ever. Overheated polar bears were to be wandering aimlessly in an iceless North Pole *this* year. The answer? Give Gore and the UN billions. Yeah, that’s the ticket. Few doubt that the planet is warmer now than in the LIA or the interval c. 1944-76. The issue is whether the minor difference is a normal, natural fluctuation or something extreme, unprecedented & caused by human activity. The correct answer is no, there is nothing at all unusual about the apparent warming from c. 1977-96 & the observed flat-lining c. 1997-2006 (even with a super-El Nino) & cooling since then. I know the Pacific is named for being just that, and compared to the Atlantic it is quite expansive so that typhoons can be born and die without making any landfall, (e.g. currently Raymond s.w. of Baja California). Consequently there is not as much media hype about the typhoons that it does generate. Are there any theories/models for attempting to predict frequency of Pacific storms that reach hurricane categories? Is there useful purpose for creating this graph? If it was an accurate representation of the tropical storms that strike land, then it would be a valuable graph, however I am not sure that it is. Your interpretation seems as good as any. Their methodology seems arbitrary, which has no place in science. At this point the NOAA NCDC U.S. Climate Extremes Index (CEI) and associated graphs are suspect. When Sandy finally hit New Jersey and New York it was a tropical storm. What made it bad was when Sandy met up with the cold front coming from the west, which kept it running right along the coast while slowing it down, allowing it to hammer the Jersey shore and New York City and its environs for an extended time. The Atlantic Ocean — where most hurricanes that impact the USA come from — is projected to see more hurricanes develop. The world could see as many as 20 additional hurricanes and tropical storms each year by the end of the century because of climate change, says a study out today. The study was published Monday in the Proceedings of the National Academy of Sciences (PNAS), written by top climate researcher Kerry Emanuel of the Massachusetts Institute of Technology. Emanuel’s study used six newly upgraded global climate computer models to simulate future hurricane activity around the world. His study found that these killer storms will not only increase in intensity during the 21st century, as many previous studies had predicted, but will also increase in frequency in most locations. high tide on the New Jersey & New York coast, but during a spring tide.